The sacroiliac belt that wraps around the space right below anterior superior iliac spine (ASIS), above the pubic symphysis, lower third of the sacrum and the greater trochanter of the thigh on the sides. The sacroiliac belt provides additional stability to hypermobile sacroiliac joint or pubic symphysis. A hypermobile joint may produce pain, sense of instability or weakness and recurrent misalignment of the joint. If stressing the sacroiliac joint or the pubic symphysis in forward-backward or upward-downward directions cause any pain, the belt is most likely to be helpful. If the patient is able to move the leg forward or backward more easily when the compression force is applied to the sacroiliac joints, the belt would be able to provide the similar support. Remove the belt if the compression force from the belt is causing any pain. Hypermobile joint causes abnormal tension in the ligaments that support the joint. This results in a change of strength in the muscles around that joint. The belt helps stabilize the joint by bringing the adjoining surfaces of the SI joint closer together, and this may improve the muscle strength. Also, the pressure applied by the belt on the surrounding skin may increase proprioceptive information into the nervous system, and this will decrease the pain through ‘Pain Gating Mechanism.' Muscle relaxation of the tensed muscles following pain reduction would reduce the tendency of joint malalignment. Other than that, the pressure applied by the belt on hip abductors and buttock muscles decreases the maximum contraction strength of these muscles. This effect would be similar to the forearm band for a tennis elbow. However, Chiropractic-in-Malaysia's clinical teams of chiropractors and physiotherapists recommend that you limit the use of these belts. 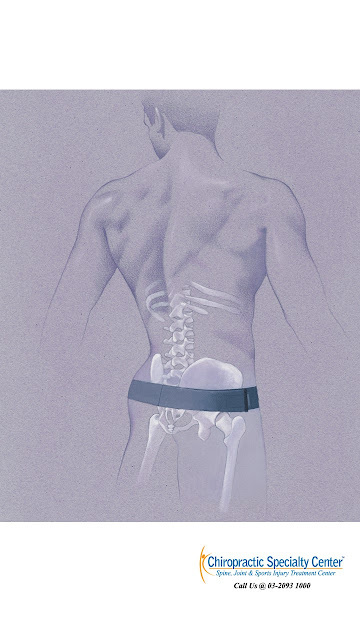 Belts and supports that surround the hips, back and pelvis should be used for limited time. The best means of stability is fixing the root-cause of your condition. And that is where our clinical teams come in. Supports should not be worn more than two hours at a time. Also, avoid wearing such supports for more than a week. Should the pain continue to get care from an expert team? Our hip pain treatment is better than others in Malaysia. We use advanced technology that others don not have. Call our main center at 03 2093 2000 to get information about our belts, their uses and treatment options for hip pain that others don not have in Malaysia.